BROADWAY BARKADA presents Balikbayan: A DC Homecoming Concert on December 17 at Bistro Bistro in Washington, DC. More than 40 Broadway Barkada members attended a performance of Hansol Jung’s Wild Goose Dreams at The Public Theater on December 11 to support New York Barkada member Jaygee Macapugay and the rest of her cast mates Dan Domingues, Lulu Fall, Kenyl Ito, Francis Jue, Peter Kim, Michelle Krusiec, Joél Pérez, Jamar Williams and Katrina Yaukey. After the show, we headed next door to The Bari for Broadway Barkada’s holiday party. Broadway Barkada’s co-founders Liz Casasola, Billy Bustamante, and Brian Jose chatted about Balikbayan: A DC Homecoming Concert, which will be presented one night only, Monday, December 17th at 7:30PM at Bistro Bistro in Washington, DC. Bistro Bistro is located at 1727 Connecticut Avenue N.W. , Washington D.C. Celebrating Philippine Independence Day, the concert includes cast members of the US Tour Company of Miss Saigon, artists on Broadway and Off-Broadway, as well as local Washington, DC Filipino artists. Broadway Barkada will be producing the concert in partnership with La Ti Do Productions. The show will be directed by Broadway Barkada co-founder, Billy Bustamante with musical direction/arrangements by Paige Rammelkamp. New York Barkada members Billy Bustamante, Cyn Casasola, Liz Casasola, Emy Coligado, Audri Dalio, Brian Jose, Bennyroyce Royon; Miss Saigon cast members Eric Badique, Christine Bunuan, Eymard Cabling, Joven Calloway, Red Concepcion, Jonelle Margallo, Julius Sermonia; and local DC talent Matthew Aninzo, Lumi Bustamante, Krystle Cruz, Russwin Francisco, Sally Horton, Jordan Moral, Justine Moral, Don Mike Mendoza and Michael Santos Sandoval. Part of the proceeds from Balikbayan: A Homecoming Concert will be donated to The Filipino Veterans Recognition and Education Project. BROADWAY BARKADA was co-founded by Liz Casasola, Billy Bustamante, and Brian Jose in the fall of 2009. They are a collective of professional artists whose mission is to provide a community for the Filipino artist, that CULTIVATES their talents, EDUCATES their audiences, and ELEVATES their global impact. La Ti Do’s strives to be a premier community of cultural and artistic diversity and inclusion through music and spoken word collaboration. Filipino Veterans and Education Project (FilVets) is a nonpartisan, community-based, all-volunteer national initiative whose mission is to raise awareness through academic research and public information and obtain national recognition of Filipino and Filipino-American WWII Soldiers across the United States and Philippines for their wartime service to the U.S. and the Philippines from July 1941 to December 1946. Brian Jose and Lia Chang. Photo by Billy Bustamante. Daniel May, Jaygee Macapugay, Geena Quintos, Austin Ku, Kristen Faith Oei, Lia Chang, Emily Stillings, Kara Guy, Jon Hoche, Raymond J. Lee and Billy Bustamante. David Henry Hwang (play and lyrics) and Jeanine Tesori’s genre defying play with a musical, which ends its Bay Area premiere at San Francisco’s Curran (445 Geary Street) tonight, is must see theater. SOFT POWER is a Center Theatre Group co-commission with The Public Theater and had its world premiere at the Ahmanson Theatre in Los Angeles. Tickets for SOFT POWER range in price from $29-$175 and are available by calling 415-358-1220 or visiting SFCURRAN.com/soft-power. Directed by Leigh Silverman (Violet) and choreographed by Sam Pinkleton (Natasha, Pierre, & the Great Comet of 1812), SOFT POWER rewinds our recent political history and plays it back, a century later, through the Chinese lens of a future, beloved East-meets-West musical. In the musical, a Chinese executive who is visiting America finds himself falling in love with a good-hearted U.S. leader as the power balance between their two countries shifts following the 2016 election. I flew to San Francisco to catch SOFT POWER and visited with some of the cast post-show. Also in the house that night – Joel de la Fuente and director Lisa Rothe – who are currently in rehearsal for Jeanne Sakata’s Hold These Truths at Theaterworks SV. I am proud of the Asian American representation and overwhelmed by the level of humanity portrayed onstage. Thank you to the cast for your brave, brilliant and vulnerable performances and to the creative team for their powerful storytelling. The creative team includes scenic design by Tony Award winner David Zinn, costume design by Drama Desk Award winner Anita Yavich, lighting design by Mark Barton, sound design by Tony Award nominee Kai Harada, orchestrations by Drama Desk Award winner and Tony Award nominee Danny Troob, dance arrangements by John Clancy, music supervision by Chris Fenwick, music direction by David O, hair and wig design by Tom Watson, make-up design by Angelina Avallone and casting by Heidi Griffiths, CSAand Kate Murray, CSA. The dramaturg is Oskar Eustis. The production stage manager is David Lurie-Perret. As original as it is topical, SOFT POWER overflows with the romance, laughter and cultural confusions of the golden age of Broadway. SOFT POWER is inspired by the legacy of classic American musicals such as The King and I as well as China’s current quest for international cultural influence, also known as SOFT POWER. Hwang is a playwright, screenwriter, television writer, and librettist, whose stage works includes the plays M. Butterfly, Chinglish, Yellow Face, Kung Fu, Golden Child, The Dance and the Railroad, and FOB, as well as the Broadway musicals Elton John & Tim Rice’s Aida (co-author), Flower Drum Song (2002 revival) and Disney’s Tarzan. He is also America’s most-produced living opera librettist, whose works have been honored with two Grammy Awards, and he co-wrote the Gold Record “Solo” with the late pop star Prince. Hwang is currently a Writer/Consulting Producer for the Golden Globe-winning television series “The Affair,” and his screenplays include Possession, M. Butterfly, and Golden Gate. Born and raised in Los Angeles, Hwang is a Tony Award winner (M. Butterfly) and three-time nominee, a three-time Obie Award winner and a two-time finalist for the Pulitzer Prize. Recent honors include the 2011 PEN/Laura Pels Award for a Master American Dramatist, the 2012 Inge Award, the 2012 Steinberg Distinguished Playwright “Mimi” Award, a 2014 Doris Duke Artist Award and the 2015 IPSA Distinguished Artist Award. He is Chair of the American Theatre Wing and sits on the boards of Young Playwrights Inc. and the Lark Play Development Center. Hwang was recently the Residency One Playwright at New York’s Signature Theatre and currently serves as head of playwriting at Columbia University School of the Arts. In 1998, East West Players named its new mainstage the David Henry Hwang Theater. Tesori returns to Curran, where in January 2017, Fun Home was the first performance following the theater’s extensive renovation. Broadway credits include Fun Home (2015 Tony Award winner), Violet, Caroline, or Change, Shrek The Musical, Thoroughly Modern Millie, Twelfth Night (Lincoln Center Theater) and John Guare’s A Free Man of Color. 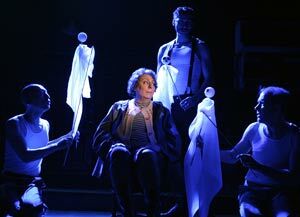 Tesori also collaborated with Tony Kushner on Mother Courage starring Meryl Streep at the Delacorte. Her opera credits include A Blizzard on Marblehead Neck (libretto, Tony Kushner; Glimmerglass) and The Lion, the Unicorn and Me (libretto, J. D. McClatchy; Washington National Opera). Her songs are featured in the Netflix revival of “Gilmore Girls.” She is the artistic director/co-founder of A Broader Way, an arts empowerment program for girls from underserved communities; the founding artistic director of Encores! Off-Center; and a lecturer in music at Yale University and Columbia University. Tesori is a member of the Dramatists Guild. SOFT POWER, the play featuring a musical by David Henry Hwang (play and lyrics) and Jeanine Tesori (music and additional lyrics), has performances at San Francisco’s Curran (445 Geary Street) through July 8, 2018. SOFT POWER is a Center Theatre Group co-commission with The Public Theater and had its world premiere at the Ahmanson Theatre in Los Angeles. Tickets for SOFT POWER range in price from $29-$175 and are available by calling 415-358-1220 or visiting SFCURRAN.com/soft-power. David Henry Hwang (M. Butterfly, Flower Drum Song) and Jeanine Tesori (Fun Home). Directed by Leigh Silverman (Violet) and choreographed by Sam Pinkleton (Natasha, Pierre, & the Great Comet of 1812), SOFT POWER rewinds our recent political history and plays it back, a century later, through the Chinese lens of a future, beloved East-meets-West musical. In the musical, a Chinese executive who is visiting America finds himself falling in love with a good-hearted U.S. leader as the power balance between their two countries shifts following the 2016 election. Award-winning actor Francis Jue returns home to San Francisco to star as DHH in the Bay Area premiere of Soft Power, the play featuring a musical by David Henry Hwang (play and lyrics) and Jeanine Tesori (music and additional lyrics), at San Francisco’s Curran (445 Geary Street) through July 8, 2018. A Center Theatre Group co-commission with The Public Theater, Soft Power had its world premiere at the Ahmanson Theatre in Los Angeles. I chatted with Francis the day before he flew to SF for the run of Soft Power at the Curran. Lia: How would you describe Soft Power? Francis: Soft Power defies genre. It’s a comedy, it’s a romantic drama, it’s a political thriller, and it’s a play that gets overtaken by a musical. It is sometimes satirical, it’s hysterically funny, and then other times it is deadly in earnest. It’s a love story and it’s also a play of ideas. It never stops evolving and changing. It forces us onstage and those in the audience to keep re-examining how we choose to look at ourselves and the world. We keep having to answer the questions, Who are we? What story are we telling? Why are we telling the story this way? That’s really eternal. That’s what the country has done since its inception, since the Bill of Rights. Look at how the country is evolving just in the last couple of years. What it means to be American seems to keep being redefined in profound ways daily. Francis: I had an amazing time in LA with CTG’s world premiere of Soft Power in the Ahmanson Theater. Audiences were really enthusiastic, and the show gave us back so much. Also, the collaboration with the creative team has been really inspiring. Lia: Who do you play? Francis: When Leigh first asked me if I would consider playing David Henry Hwang in Soft Power, my first question was, “Do I get a wig?” I think I went to a ridiculous question first because it truly is an intimidating prospect, playing someone that I know, that I’ve met, that I’ve worked with and who I admire so much. I literally idolize this man, for his intellect, for his generosity, for his compassion, for his ability to articulate feelings and ideas. Throughout this process, I’ve wondered if I had the capacity to portray all of those things. This has been an unusually stressful process for me because I do admire him so much. No one ever asked me to imitate him, to do anything but play this character as written, just like any other play. I’m so grateful that I get to play someone who is so complicated, who has such imagination and ego and righteousness, who wakes up to some hard realities. For a long time, I felt like I was expressing David’s id, his inner child that he doesn’t allow himself to express in everyday life. That really appealed to me, that I could express those impulsive, often censored thoughts and feelings. It took me a while to figure out that although the play may start that way, by the end, I am talking about really personal, painful and hopeful things. I realized that the stuff that David talks about in the play didn’t just happen to him, it happened to his family as well. It didn’t just happen to his family, it happened to our community – our theater community, our Asian American community. It didn’t just happened to our community, it happened to America. It is happening to America. DHH awakens to this in the play as well. I can’t tell you how grateful I am and what an awesome responsibility it is to be trusted by David and Jeanine and Leigh and Sam to do what I am doing in this play. It makes me feel better than I am, and braver. And I think audiences feel braver by the end of the play as well. They respond with so much affection, it’s sort of a rallying cry for coming together – what theater is all about, what America is supposed to be about. Lia: How long have you been involved with Soft Power? Francis: I was asked late in 2016 by director Leigh Silverman if I would attach myself to a project written by David Henry Hwang and Jeanine Tesori. I asked, “What is it?” And she said she didn’t know – there was nothing written yet! I said, “Well, I would love to because it’s you guys, but I’ve already agreed to do all these other things.” I gave her my itinerary for the next year, and she said they’d work around it. I did a number of readings throughout 2017, in between other shows. CTG told me they had 13 different development work sessions over the course of the last two years. It changed a lot during that time. David started working on this before the 2016 election, before he was stabbed, before many of the current events that are happening right now. As these events happened in his life and our country’s life, I think this show began to find its focus, its reason for being. For David to speak this personally is astounding to me and brave. It scares me every night, and I’m loving it. Lia: How has the show changed from 1st preview to opening night? Francis: We got as many as 20-25 new pages every day during previews. There were new numbers added. There were internal cuts. The monologues I do in the show changed ’til the very end, right before opening. This creative team was going to use the time they had to make sure the show really said what they mean. And this company pulled up their big boy and big girl pants and did what professional actors and stage managers do so well, integrating changes really quickly. We learned a lot from doing the show and from our audiences in LA. Lia: How many times have you worked with David and Leigh? Francis: With David on full productions – M. Butterfly, Kung Fu, Yellow Face, and Soft Power. With Leigh – Yellow Face, Coraline, Kung Fu, Wild Goose Dreams, Soft Power. I’m just so grateful to be working with them. I really feel like we’ve developed a trust and a short hand and a collaboration that uses all of me. I adore them and I think they are brilliant. 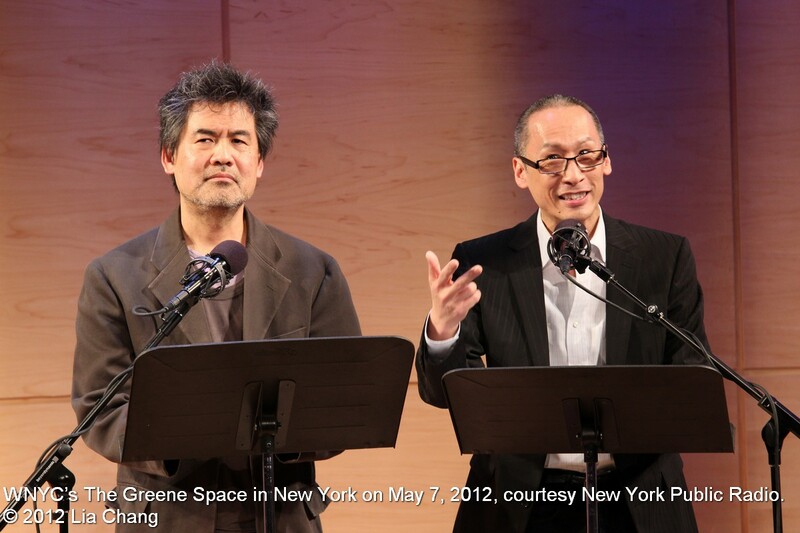 What was it like to play David Henry Hwang’s father in Yellow Face? Francis: I didn’t feel the same kind of pressure playing David’s father, because I’d never met him. What he wrote was so crystal clear to me. I identified with it immediately. The only note I remember David giving me about his father was that he stood tall. I had been exploring ways to signify age, stooping my shoulders a bit. David’s one note told me everything that character was about – his gregariousness, his pride, his enthusiasm, his optimism, his faith. David is so brilliant, that with that one note I could extrapolate the essence of the character, and the reason he was in the play at all. The one note he had for my playing him in Soft Power was that he wanted me to use the same pen that he uses when he writes. It’s a really nice pen! It feels really good in my hand, and writes smoothly, making it easy to glide across the page. It tells me a lot about his sense of style, how he presents himself to the world – and about how he creates from his sub-conscious, allowing his characters to speak to him. Lia: What shows have you done in San Francisco? 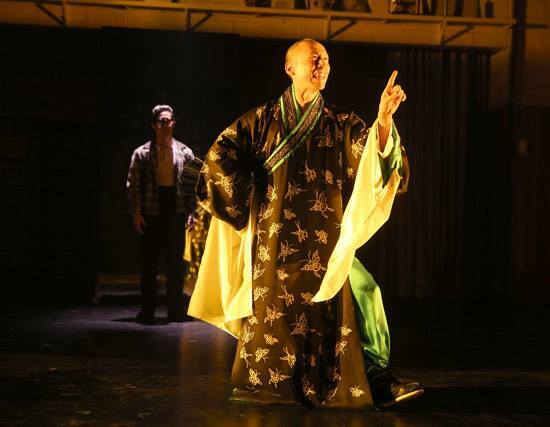 Francis: I did Philip Gotanda’s After the War at ACT’s Geary Theater, David Rabe’s A Question of Mercy at the Magic Theatre, and Philip Gotanda’s Song for a Nisei Fisherman with the Asian American Theatre Company. I’ve done lots of shows at TheatreWorks as well. I grew up in San Francisco. I went to Star of the Sea and Saint Ignatius. Most of my family still lives in the Bay Area. I am so looking forward to doing this particular show in San Francisco, and saying what we get to say in this show. I am so looking forward to representing. Lia: What is it like to be working in this company comprised of predominantly Asian American actors? Francis: There is something really special about working with other Asian Americans in this business. Partly it is because we have fewer opportunities to work at all. In my experience any primarily Asian American company has really bonded. We spend a lot of time together, not just at work, but also at play. This show in particular has really inspired this particular company to speak from our hearts. We used to circle up during rehearsals and talk about what the show means and what it means to us in particular. We don’t just get to talk about being Asian – we get to talk about being American. There is something about working with your peers, and working on a story where everyone has something in common. What kills me is that I look at this company of younger Asian American performers who are so much more skilled and so much more qualified than I was at their age, who have had wonderful opportunities, but not nearly the opportunities that they deserve. Lia: What are the 3 most challenging aspects about doing this show for you? Francis: First – It had been a long time since I had done a musical. Somewhere along the way, I had convinced myself that I couldn’t sing. It’s been very challenging to be in a room where people are writing new music and asking me to try stuff on. I feel extremely vulnerable. Second – For a long time I have wanted just to be a human being on stage, not a symbol or a representative of some exotic other. Even though Soft Power is giving me this opportunity, this has been really hard for me. Actually taking the stage and not talking about somebody else’s feeling, but my own, has been challenging. Third – I turned down a lot of things to attach myself to this long-term project. I usually say yes to almost anything, because I never believe I will ever work again. So turning down other work to remain available for this was really difficult. I hate saying no, I hate disappointing people. But I have been given back so much more than I ever could have imagined. Premiering this new show, and getting to work with my idols, has been a dream come true. I dreamed about doing something like this when I was a little kid, but I never thought it would happen. To have David Henry Hwang write something from his own heart that is so vulnerable and funny and challenging, and ask me to continue to work on it, has been the gift of a lifetime. Lia: You have portrayed Minister Chen on “Madam Secretary” on CBS for several seasons now. Francis: “Madam Secretary” is such a great gig! It’s smart and intelligent and funny. There’s a lot of wish fulfillment – we wish we had people like Tea Leoni working in our government right now. And I love playing Foreign Minister Chen because I don’t often get to play guys who actually have that much authority. I’m so grateful that they’ve given me the opportunity to develop this character over multiple episodes over the last four seasons. Stay tuned – Minister Chen may come back for season five! In 2017, you appeared in the world premiere of Hansol Jung’s Wild Goose Dreams at La Jolla Playhouse. The play was nominated for three 2017 Craig Noel Awards including Outstanding Featured Performance in a Play for you, Outstanding New Play and Outstanding Sound Design. Francis: When Leigh Silverman sent me the script of Wild Goose Dreams, I literally did not understand the words on the page. It wasn’t until the first day of rehearsal at La Jolla Playhouse where I heard it aloud, that I began to understand this beautiful piece of work. It’s a play that a lot of people identified with because it is about alienation, even though the internet connects us to just about anything and everything. I have to give total credit to playwright Hansol Jung. She was able to make all these disparate voices on the internet – pop-ups, spam, e-mail, instant messages – sound like a unified chorus, while telling this really beautiful story about a woman alienated from her father, from her country, from her own identity, as she tries to figure out her existence in South Korea. Lia: You played Larry Yee in Lauren Yee’s King of the Yees in Chicago and L.A. and were nominated for a a 2017 Los Angeles Drama Critics Circle Award for Featured Performance in Play. Can you tell me how the play spoke to you? Francis: In King of the Yees, Lauren Yee has written a hilarious and touching play, inspired by her relationship with her father and his relationship with Chinatown and Chinese Family Associations. I felt like I was spending time with my own family while working on that play. I love it so much. And non-Asians identified with it so much, saying how it reminded them of their own father, or their relationship with their own daughter. It would make audience members want to call their folks. I can’t say enough about Lauren Yee and Josh Brody, who directed it with such a deft, sensitive hand. Lia: Happy Pride Month. Congrats on your recent nuptials. Why did you decide to wait 30 years? Francis: Randy Adams and I have been together for 30 years. We didn’t get engaged until marriage was legal all across the country. For me personally, I didn’t want to get married and have it taken away. I didn’t want to be married in one state and go to work in another state where I wasn’t married. So we waited. Once we were engaged, we couldn’t figure out how our should work. We have so many friends in New York, his family is in Ohio, and my family is in California. Trying to figure it out prevented us from getting married for a long time. Finally, we got to the point where we decided in our heart of hearts that it would be okay to go to City Hall. We didn’t tell anybody except the few friends who witnessed and took pictures. We wanted to do it on our 30th anniversary, but that was the day of my first rehearsal for Soft Power AND the day that Randy was called for jury duty. So we got married on the Friday before. The Soft Power creative team includes scenic design by Tony Award winner David Zinn, costume design by Drama Desk Award winner Anita Yavich, lighting design by Mark Barton, sound design by Tony Award nominee Kai Harada, orchestrations by Drama Desk Award winner and Tony Award nominee Danny Troob, dance arrangements by John Clancy, music supervision by Chris Fenwick, music direction by David O, hair and wig design by Tom Watson, make-up design by Angelina Avallone and casting by Heidi Griffiths, CSAand Kate Murray, CSA. The dramaturg is Oskar Eustis. The production stage manager is David Lurie-Perret. Tickets for SOFT POWER range in price from $29-$175 and are available by calling 415-358-1220 or visiting SFCURRAN.com/soft-power. SOFT POWER, the play featuring a musical by David Henry Hwang (play and lyrics) and Jeanine Tesori (music and additional lyrics), will make its Bay Area premiere at San Francisco’s Curran (445 Geary Street) June 20 – July 8, 2018. SOFT POWER is a Center Theatre Group co-commission with The Public Theater and will perform at the Curran following its world premiere at the Ahmanson Theatre in Los Angeles. Tickets for SOFT POWER range in price from $29-$175 and are available by calling 415-358-1220 or visiting SFCURRAN.com/soft-power. David Henry Hwang (M. Butterfly, Flower Drum Song) and Jeanine Tesori (Fun Home). Season subscriptions- including tickets to all four #CURRAN2018 productions, as well as tickets to one complimentary SHOW & TELL event of the buyer’s choosing-range in price from $116-$744 and are available now by visiting SFCURRAN.com/soft-power or calling 415-358-1220. As this is the first time the new Curran is offering a season subscription, buyers will have the rare opportunity to select their exact seat locations. Buyers will also get preferred access to all additional special programming, fee-free exchanges on subscription tickets, and a free membership to the Curran Club with additional perks including invitations to member-only events, special offers, and exclusive discounts.